Call me old fashioned: I just don’t see myself curling up any time soon with a Kindle. After two beloved bookstores in my neighborhood — Berkeley, a legendary university town no less – closed up shop this year (Cody’s & Black Oak) I swore off Amazon forever. So, today, in time perhaps for your vacation reading, a shout out for the independent book store. A couple of weeks ago I ventured inside another SF gem, The Green Arcade, which specializes in eco-conscious works, and includes books on urban homesteading, manifestos on eating well, all manner of writings about the slow food movement, and cookbooks on niche subjects such as gluten-free foods. Back in my hometown, Mrs. Dalloway’s stocks a nicely curated collection of food and gardening tomes, and hosts events like the recent reading by chef Deborah Madison and her artist husband Patrick McFarlin, who talked about what people eat when they eat alone. 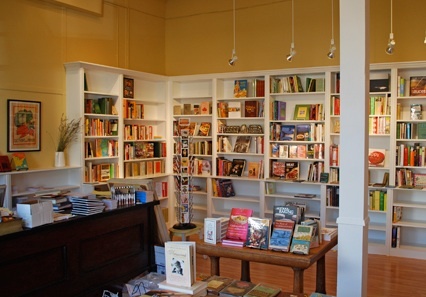 And Book Passage, both in Corte Madera and the San Francisco Ferry Building, frequently hosts “cooks with books” events. Listening to Molly Wizenberg read from A Homemade Life at one such evening inspired me to finally launch Lettuce Eat Kale a few short months ago. I do realize that in these economically uncertain times buying new books — hardbacks no less — is a luxury many can’t afford. It’s one of my few, if infrequent, indulgences. I’ve also had great success with bargain finds at the three Pegasus & Pendragon locations in the East Bay. For some reason I get terrific Aussie cookbooks there by the likes of Donna Hay and Bill Granger for a fraction of the price I’d pay in Australia. It’s also a good spot for used paperback food memoirs. Okay, despite the recent closures we’re spoiled rotten for bookstores in the Bay Area. How about your hometown? I do my bit to share the wealth. I’m hosting a monthly food book giveaway on this very blog. I no longer believe in hanging on to works of fiction I’ve loved just so they can gather dust in my bookshelves. So I pass them on to friends who I think will enjoy them as much as I have. My son and his buddies have started doing something similar, which makes me very happy. So, folks, is the dead-tree read well on the road to obsolescence or do you think it will survive? is there still a place for shops peddling inked paper in the modern world? Hope springs eternal here: Just this week the news that indie Books Inc. will open not far from the space formerly occupied by Cody’s. Happy summer reading. Don’t forget your local library! Libraries are also faring worse in these economic times with cuts to their budgets but if you’re looking for something and your library doesn’t own it, you should always submit a request that they get it. Chance are they’ll buy it. The Cal library has a fab collection of cookbooks … the glitterati among the Bay Area foodies have been spotted in the stacks doing research. Yes, of course, the library. And thanks to a librarian for reminding me. Now, do tell, which food folk have been spotted in the stacks at Cal?? ?